Boksburg is a suburb situated on the East Rand of Gauteng, South Africa. Originally, Boksburg was laid out in 1887 to serve the surrounding gold mines, and named after the State Secretary of the South African Republic, Eduard Bok. 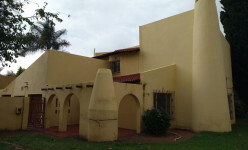 The Main Reef Road linked Boksburg to all the other major mining towns on the Witwatersrand and the Angelo Hotel was used as a production post. Boksburg is now part of the Ekhuruleni Metropolitan Municipality, which includes much of the East Rand. Interestingly, the Mining Commissioner Montague White built a large dam which remained empty for years. It was nicknamed White's Folly until a flashflood in 1889 silenced all critics. It became what is now known as the Boksburg Lake. This spectacular lake is over 150,000 square metres and is surrounded by lawns, trees, and terraces. This is a popular boating, fishing, watersport and hiking destination for many. The scenery here is lovely and many families enjoy blissful and entertaining days here. Boksburg boasts a diversified industrial and mining centre. It has become one of the most important gold-producing towns on the Witwatersrand. Boksburg is also any shoppers delight. It boasts the East Rand Mall which is one of the most popular and biggest malls in Johannesburg. The East Rand Shopping Mall offers all the chain shops, restaurants and movies typical of such complexes. Yet, it also boasts a pleasure park known as Wild Waters with plenty of water fun such as water slides and 8 other such activities. The Fun Factory offers roller skating and 10-pin bowling. This fabulous mall offers over 170 different shops as well as extensive entertainment facilities, which include a Games Arcade, Restaurants, Coffee shops, a nine theatre Cinema Centre and an exciting Food and Entertainment Mall. You can never be bored here! 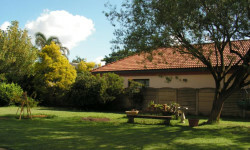 For fun family outings why not take a visit to the Bokkie Park. This beautiful area offers children fun farm experiences, such as milking cows and feeding the different fun loving animals. In addition, one can visit the Le Grange Bird Park which affords one the opportunity to explore the diverse range of vibrant birds in this area. For the history lovers, there are numerous historical buildings one can explore. These include the Old Post Office built in 1898, the Law Court since 1890, St Michaels and All Angels Anglican Church designed by the Sir Herbert Baker as well as a few gold mines. 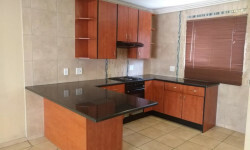 33, Lakefield Avenue, Benoni, Gauteng, 1501.